Posted January 23, 2015 - oey Hand knows first-hand how a simple pleasantry can turn into something truly wonderful. A “Hey, how ya doing?” from the race car driver from Sacramento to race team owner Chip Ganassi at last October’s Petit LeMans at Road Atlanta evolved into a new chapter of his career. After three seasons racing in Europe for BMW, Hand, 35, said he was looking for the right opportunity to return stateside and continue his career behind the wheel of some of the world’s fastest race cars. He’s signed with Chip Ganassi Racing for the 2015 Tudor United SportsCar Championship season and will join Auburn’s Scott Pruett and Chip Ganassi’s two IndyCar drivers, Charlie Kimball and Sage Karam, for this weekend’s Rolex 24 at Daytona International Speedway in Daytona Beach, Fla. So Hand approached Ganassi, shook his hand and before he could move on, Hand said Ganassi asked him to come drive for him in 2015. A more formal meeting was set where Ganassi asked Hand to join his No. 01 Daytona Riley-Ford Prototype team. After mulling over the offer for a day, Hand made the decision to bring his family back to the United States and rejoin Pruett, his friend and mentor of sorts, who has a chance to become the first six-time winner of the Rolex 24 endurance race. Pruett, 54, is tied for the record of five wins with Hurley Haywood. 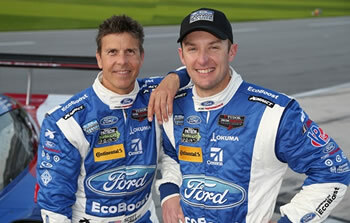 The fact that Ford is sponsoring a car that now has four American drivers is not lost on Hand. He also pointed out that Ganassi is employing three Sacramento-area drivers in the two cars his team will field this weekend. Joining the mix behind the wheel of the team’s No. 02 car is Elk Grove native and reigning NASCAR Rookie of the Year Kyle Larson. Larson teams with fellow NASCAR driver Jamie McMurray and IndyCar drivers Scott Dixon and Tony Kanaan. Hand is preparing for the Rolex 24, which kicks off the 2015 season, but is looking forward to the entire season rather than just a one-off assignment.